LOTS OF PICTURES FURTHER DOWN THE PAGE! 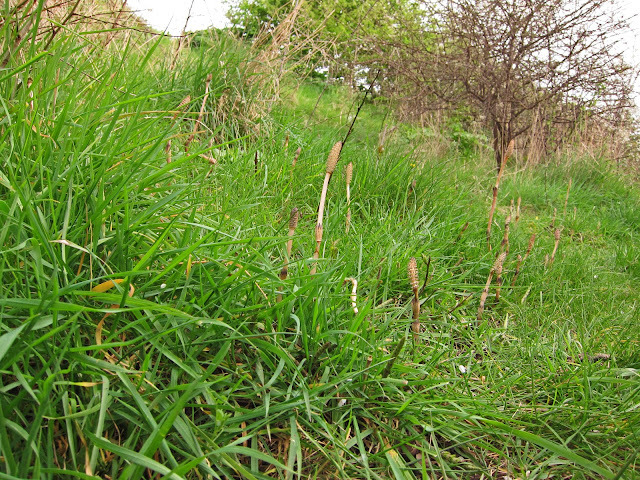 There's a grassy bank near where I live where strange things grow. Every spring, disgusting little stalks appear. 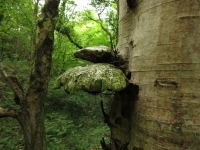 They look like fungi which have muddled their identity with plants - or the other way round. Then they vanish. Grass and spring flowers grow up around them and, over and over, I loose track of what happens next. Do they wither and die or grow into something prettier . . . and if so . . . what? How come I never notice an unfamiliar plant in with the rest? This year, I decided to watch. I became a sort of private eye, going back and back and back to see what was going on but, yet again, I missed the magic moment when they disappeared. What was going on? Well, one thing happened . . . that I missed it again. Simply missed it. The magic must have happened very quickly. Long and short . . . and going round in circles . 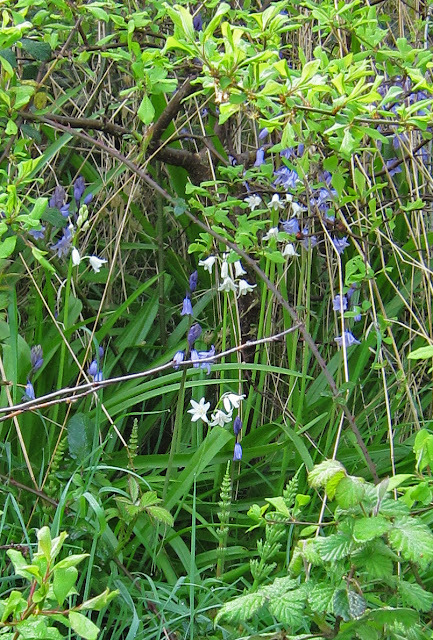 . . these plants - whose forbears lived as ground cover in prehistoric forests - have several ways of growing. 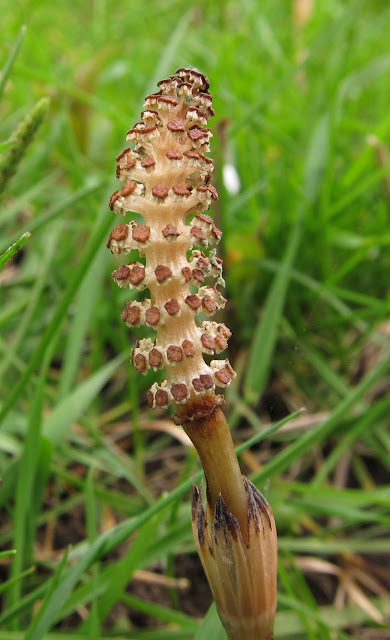 The yucky things on stems are the same variety of plant as the familiar green horsetails which come later. They spring from the same source and . . . I've given up trying to understand (for the moment). If you are interested to learn more, it would be worth it. I'm reluctant to explain anything because my knowledge is thin and I don't know enough to weed out mistakes from facts when it comes to Horsetails on the internet. Fortunately, Happy Mouffetard has kindly provided a link to a diagram and more information - so that's a start! 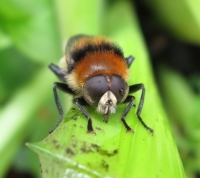 For this post, I'll confine myself to observation - how the first kind came; how they were superceeded by the (very different looking) rest - and encourage you to look out for them. They aren't fully grown yet. I don't want to delay this post until they are fading. You will want to marvel at them now! 2nd April 2011. A grassy bank with things sticking out of it. The tall ones are four or five inches high. The smallest are like this. Ones at the next stage are like this. The tops may be (to my eyes) ugly but this part of the stem (to my eyes) is beautiful and fascinating. Then . . . spores are released. (I think this is what is happening!) 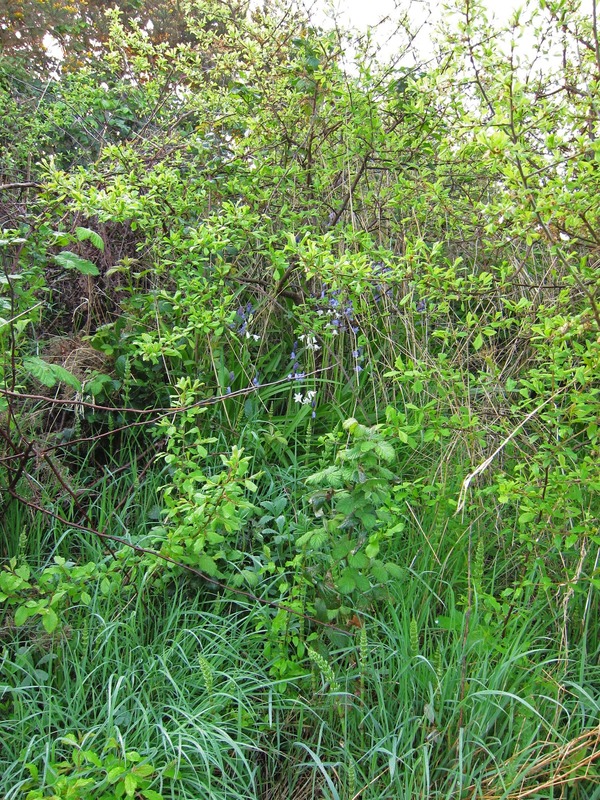 Hopefully, someone will say - which is a good moment to thank Toffee Apple, Rob and Michael Peverett for identifying the plant (with blue flowers) in the last post as Green Alkanet. Moving from 2nd April to the 8th . . .
Close up - with dew! - Also April 8th. Look at the foot of the picture for emerging horsetails. Gradually, a short forest grows. The horsetails below are about seven inches high. This is how they were on 22nd April. And, in their most recent state, on the 1st of May. This one is nine or ten inches high. May 1st 2011 - this one is leaning because of the wind and direction of the sun. This is not the end of the story. Their arms will lower to 90 degrees from the stem. Watch out! 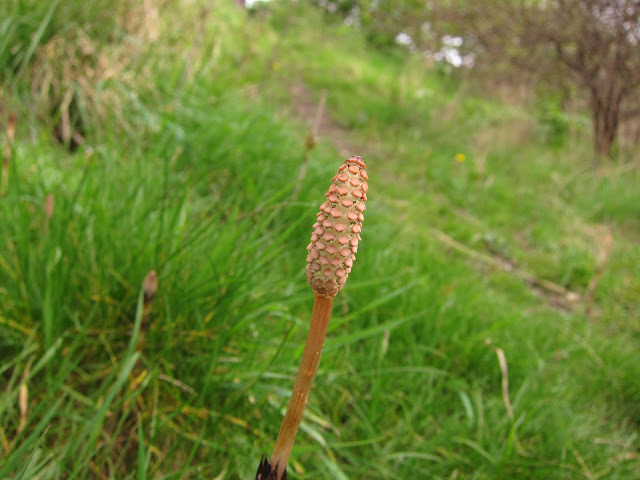 There are horsetails about! And, now you know - remember the spot if you find them and see if you can find the early versions next year. Interesting post, thanks for going back and recording their progress! Thank you for reminding me that they are beautiful and fascinating plants, and not just pernicious weeds. In bad years on the allotment, my index finger wears a groove in it where I try to pull these things up - it is very satisfying when you get a good length of root coming up. Mind you, I say good length meaning around 5-10cm; I believe their roots can go metres down. Absolutely fascinating! I travel up to London quite often for work purposes, and my train often pauses for a few minutes just outside Clapham Junction. From the train window I have been observing the lifecycle of the Horsetail, just like you! 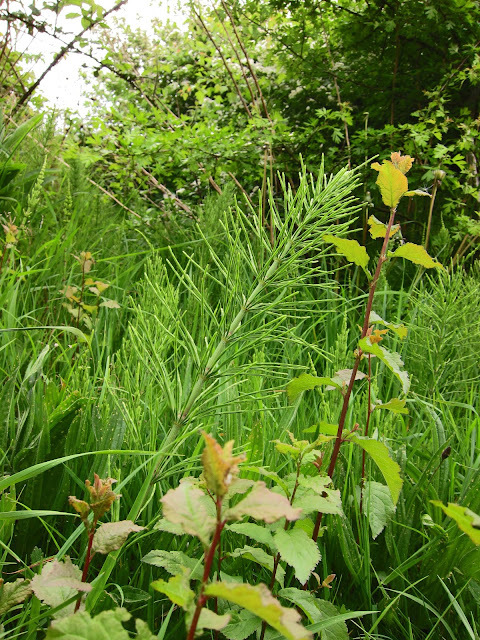 I grow Elegia capensis, a restio, because the 'leaves' come in whorls like your horsetails. Apart from the ickky stage, I love the green stage of your plant. Truly wild Lucy! Weirdly beautiful images but most of all love your enthusiastic narrative and your non botanical approach to the wonders of the grassy bank. 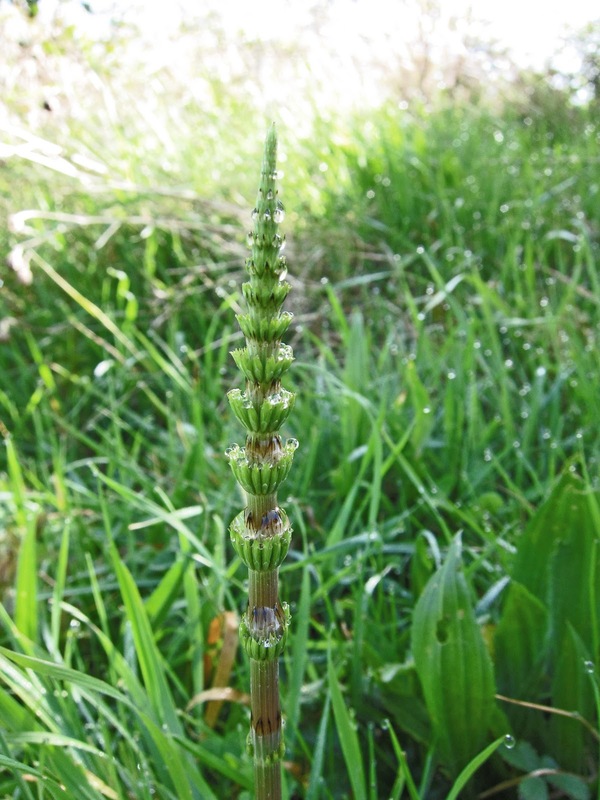 Great commentary on the Horsetail, love it, great pics too. Do you know it can be made into a tea used to control blight? Did'nt mean to be anonymous on prev post, pressed wrong thing! I think they look fascinating aslong as the wind is blowing in the other direction from my garden when it releases the spores. Our local ones are just about to release their spores. Your pics are great Lucy with my favourite being it's transistion from buff brown to green. Hello Dimple. When I first started Loose and Leafy (June 20018) things were pretty random. I posted as I noticed plants and flowers and trees which I found interesting. It's been going on long enough now to know what I'm looking for and where. It makes time go by a bit faster than I would like - but I enjoy it. Hello Donna. Each time I see them I am awed, not by their beauty alone, but by the knowledge that plants like these have been growing on earth for so long. Hello Happy Mouffetard. I'm wondering whether chopping them off with a hoe as they emerge might work. They'd keep appearing but it would save your fingers and, as they keep appearing anyway . . . ? Hello Mark. I like the idea of you sitting outside Clapham Junction, observing horsetails. Hello Elephant's Eye. I doubt, reading the comments of the others, you would be likely to be tempted to grow horsetails on purpose so I'm glad you have a tamed equivalent. Hello Patio Patch. I can't avoid it - Horsetails in gardens and allotments can be a nuisance - but so would a tiger be! But that doesn't detract from the beauty of the tiger any more than the nuisance value of horsetails detracts from theirs! Thank you all for your comments. I'm always pleased to see and read them. You might like to know the latest post is now on the blog - it's a catch up on where the tree we are following was 'at' on 25th April. I have horsetail growing in the driveway, every year they come - fascinating to watch, but I've enjoye watching the way you've captured them. Fabulous! 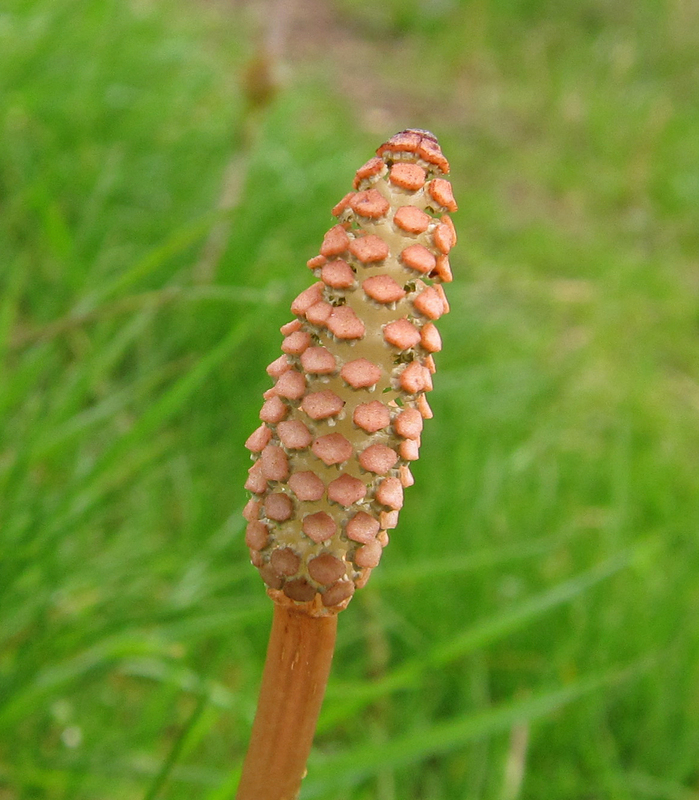 I've often wondered what those weird pre-recognisable-horsetail things were, and never made the connection. I hated horsetail when it was invading the veg patch on Anglesey, but think it is really pretty in the ditches round here. Glad I finally got around to catching up with your blog. The wood horsetail grown along the path through the woods that leads up onto Blackamoor and I love watching their progress, I was up there earlier this week and they are now at a stage of being airy and graceful. It's fascinating to watch their progress. Wow, thanks for this post - I never realised that they were connected. 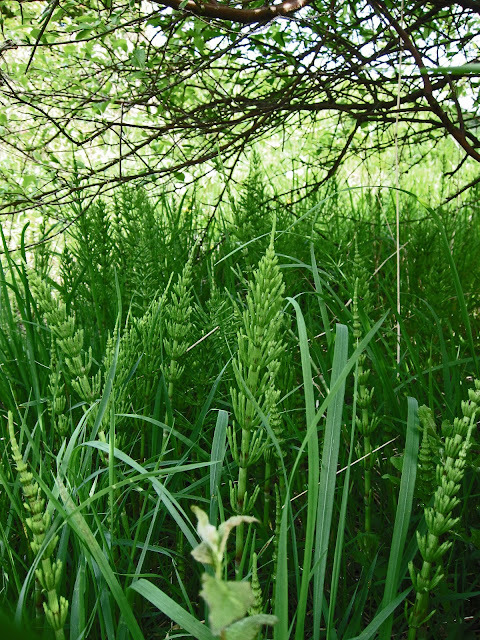 Some species of horsetail are edible, high in silica and supposed to be good for your teeth.